Israeli Prime Minister Benjamin Netanyahu—known also by his nickname “Bibi”—is expected to be named as Israel’s leader for the fifth time, extending his record-setting run as prime minister to well into it’s eighth straight year. It will also give him a chance to catch Israel’s first prime minister, David Ben-Gurion, for the longest total time serving as Israel’s leader at a little over 13 years, thanks to Netanyahu’s earlier 3-year run in the 1990s. But how did he do it? How did Netanyahu not only manage to return to power, but stay there longer than anyone else in Israeli history? The roots of Netanyahu’s reign actually came due to arguably the riskiest—and initially most damaging—political decision of his life. 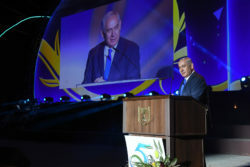 In 2005, Netanyahu served as the Finance Minister for then-Prime Minister Ariel Sharon, who was tremendously popular and politically powerful enough to conduct the disengagement from Gaza. Shortly before the Israelis withdrew from Gaza, however, Netanyahu resigned from the government in protest of the withdrawal. His acting on the belief the disengagement was a mistake worked—eventually. Yet out of the ashes, Netanyahu’s phoenix-like political bird arose. Following Sharon’s stroke, Ehud Olmert took power as the new Prime Minister and Netanyahu acted as a forceful member of the opposition. When Olmert’s political scandals drove him to resign and led to new elections in 2009, Netanyahu was effectively the new face of the center-right faction. It was he who had opposed the Gaza disengagement—which the Israeli right wing had also opposed—and it was he who was the head of the strongest center-right party, Likud. This has proven a huge advantage to Netanyahu. Under the Israeli parliamentary system, the prime minister is the leader who can form a government with the strongest coalition of parties. Since no party wins enough seats to claim a majority on their own, the game of partnering in a coalition ultimately determines who wins. The right-wing parties and the religious, despite working with the Kadima party under Olmert in the 2000s, have so far not been inclined to work with any of the center-left parties since then. The two-state solution land-for-peace withdrawal doctrine of the Israeli left, along with its largely secular nature, are key impediments toward their forming a government with the right-leaning or religious parties.